7 days 5 hours 37 min 17 sec remaining in the April competition. Ah.. at last! the last Southpark tutorial! This one finishes up with creating the body and adding some accessories and shows you how to add and use color styles. While this is a really basic construction of how to make a southpark like character, I think it gives you a really good start if you're wanting to make some southparkish toons! I also wanted to take the time to thank my subscribers and anyone and everyone who has been watching my videos! I've been trying to really build my channel over the last year and a half and I'm amazed at the support that you guys have given me! 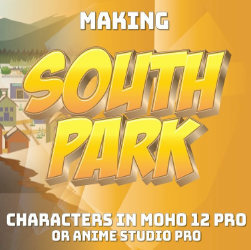 As a thanks if you'd like this anime studio 11 file just send me a message on face book (just look for poptoogi) and I'll send it to you just so you can see how its constructed and if you want to get a head start on these LONG a$$ tutorials!